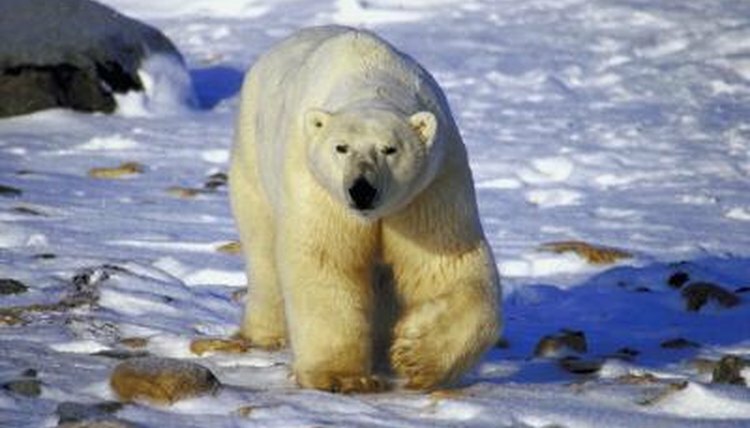 Standing up to 10 feet tall and weighing more than a ton, the polar bear is the largest carnivorous land mammal on Earth. An estimated 40,000 polar bears live in the Arctic lands of Alaska and Canada, Russia, Greenland and Norway. The polar bear’s webbed feet and almost exclusively all-meat diet distinguish him from other bear species. Polar bears eat mainly ringed seals, but when seals are scarce they eat other marine and land animals or nearly anything available. Although polar bears are skilled swimmers, they aren’t fast enough to catch a seal in open water, so they rely on stealth and patience to capture their prey. The great white bear’s most common method of hunting involves sitting within striking distance of one of the many breathing holes that seals create in the ice, and waiting. When a seal pokes his head through the hole to catch a breath -- which they must do roughly every 10 minutes -- the polar bear pounces on the seal and yanks it out of the water and onto the ice. In early summer, polar bears obtain much of their food by stalking seals basking in the sun. The bear will spot his prey and creep upon it in silence, its translucent fur camouflaging the predator against the ice and snow. Once he is within 50 to 100 feet he will charge the seal, trying to attack it before it could slip back into the water and swim away. Polar bears also stalk sunning seals from the water, swimming to the ice’s edge and leaping out of the water to attack. In the spring the bears stalk birth lairs, where newborn seals are hidden under snowdrifts, in similar fashion. When their preferred prey is unavailable, polar bears eat whatever they can get their paws on -- seabirds, fish, berries and other plant matter, and land mammals such as elk and deer. The bears have even learned to dig through human trash receptacles in search of food. Polar bears also scavenge and consume whale carcasses and carrion that other predators have left behind. Climate change and the depletion of seal populations mean polar bears must sometimes go months without food, especially during the summer months. The bears have a layer of reserve fat, or blubber, up to 5 inches thick. This layer stores energy and enables these massive animals to go lengthy periods without food. Male polar bears routinely fast for three to four months at a time, when melted ice prevents them from hunting seals. Pregnant females can go up to eight months without eating, by retreating to a den and falling into a state of semi-hibernation. Can Polar Bears Smell Well? Does a Polar Bear Break the Ice?